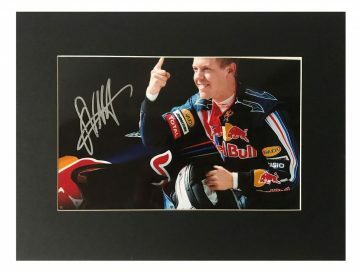 Shop signed Sebastian Vettel F1 memorabilia including autographs on a variety of Formula 1 items. Including shirts, caps, visors,& photographs of the great racing driver! Many have photo proof, all come with a Certificate of Authenticity, fast worldwide shipping and free UK delivery! 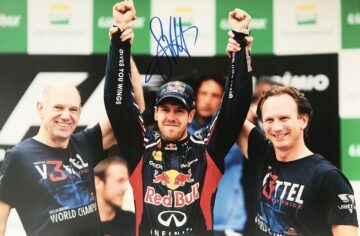 German racing driver Sebastian Vettel is a modern F1 marvel – a legend of the sport who will be remembered for a very long time. His legacy includes a plethora of remarkable wins and podium finishes, alongside several records broken and made throughout his career. Now 31, he continues to compete in Formula One and shows promising signs of continued success. 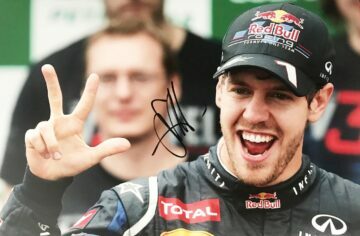 Vettel was born in Heppenheim, Germany where he began go-karting aged just 3 and a half. 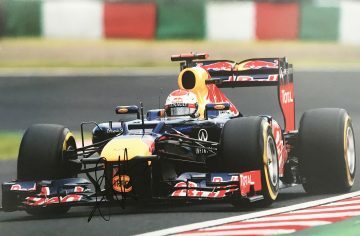 He began to race competitively aged 8, before being accepted into the Red Bull Junior Team aged 11 thanks to his promising early talent. 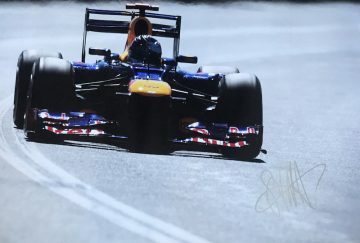 This served as a catalyst to Formula One as a young Vettel worked his way through the ranks, competing in and winning the Formula BMW Championship in Germany in 2004 before entering Formula Three. 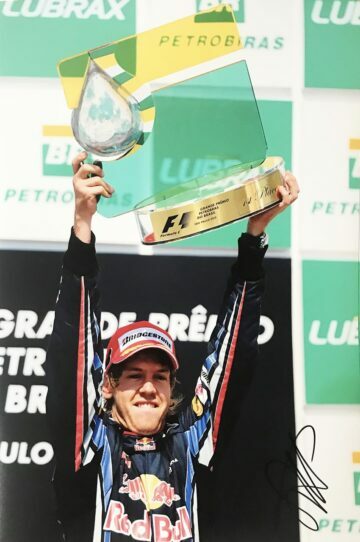 It was 2006 before Vettel made his debut in F1. 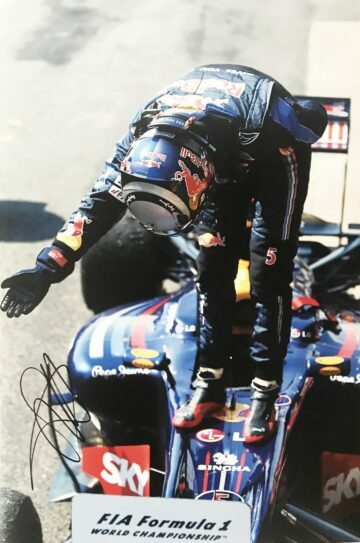 He began as a third driver and sub, finally claiming his chance to shine in 2008 with Toro Rosso. That year at the Italian Grand Prix he became the youngest driver in history to win a Formula One Grand Prix aged just 21. At the same time he broke a number of records and set the fastest times at both qualifying stages. His career as a racing driver and status as a legend had begun with a bang – and his success showed no signs of slowing down. 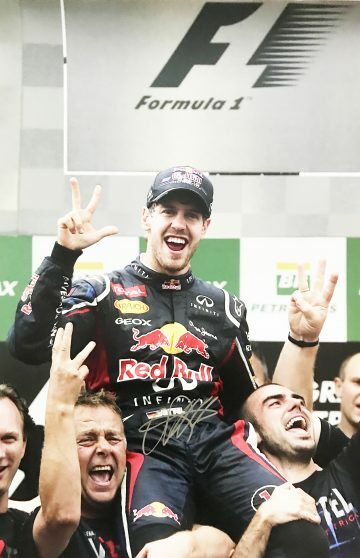 To date Vettel has four successive Formula One Championship wins to his name – in addition to 52 wins and 109 podiums. He has broken a remarkable number of records over the years, including most consecutive Grand Slams, most pole positions in a season and most wins in a season. Several were originally set by one of his racing heroes, Michael Schumacher. 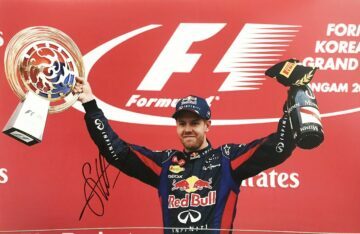 Browse and buy fantastic Sebastian Vettel signed F1 memorabilia here at Firma Stella. 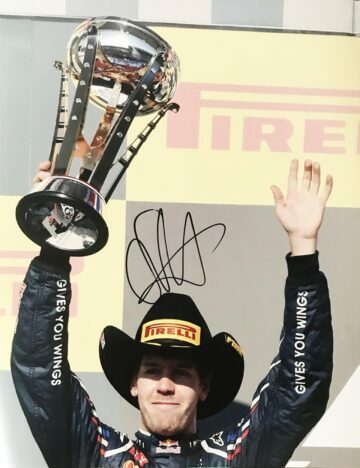 Our collection features autographed visors, caps, clothing and mounted displays autographed by one of Formula One’s modern greats.